A CreditDonkey survey reveals sons plan to spend more money on Mother's Day while daughters plan to spend less than they did the previous year. In the survey of over 800 Americans, nearly 1 in 4 son respondents said they plan to increase their Mother's Day budget, while nearly 1 in 4 daughter respondents said they plan to spend less. 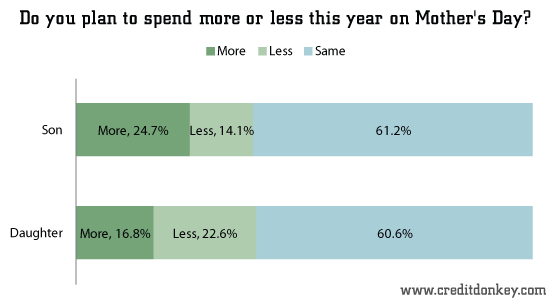 The survey shows the differences in buying habits and expectations by sons and daughters on Mother's Day, although the majority in both categories show they will likely spend the same amount as they did in 2012. 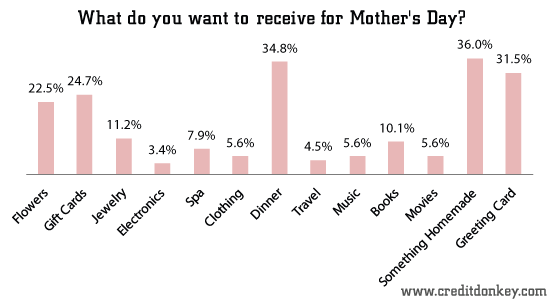 Overall, respondents plan to spend an average of $61.56 on Mother's Day. Do sons and daughters know what their moms want? 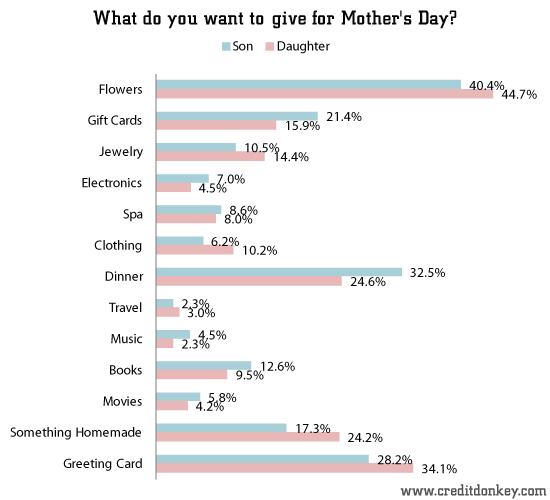 The CreditDonkey.com survey found a disconnect: Many don't give Mom what she wants. We asked over 800 sons and daughters what they want to give for Mother's Day. More daughters want to give flowers (45% of daughters compared to 40% of son respondents). Only 23% of moms want to receive flowers. More daughters want to give jewelry (14% of daughters compared to 11% of son respondents). 11% of moms want to receive jewelry. More daughters want to give clothing (10% of daughters compared to 6% of son respondents). Only 6% of moms want to receive clothing. More daughters want to give something homemade (24% of daughters compared to 17% of son respondents). 36% of moms want to receive something homemade. More daughters want to give a greeting card (31% of daughters compared to 28% of son respondents). 32% of moms want to receive a greeting card. More sons want to give gift cards (21% of sons compared to 16% of daughter respondents). 25% of moms want to receive gift cards. More sons want to give electronics (7% of sons compared to 5% of daughter respondents). Only 3% of moms want to receive electronics. More sons want to give dinner (33% of sons compared to 25% of daughter respondents). 35% of moms want to receive dinner. Sons: Stop looking at electronics. Only 3% of moms want to receive them. Consider something homemade (36% of moms want their children to make something for them). Daughters: Stop looking at flowers. Only 23% of moms want to receive them. Consider dinner or a gift card (35% of moms want dinner, 25% want gift cards). Moms: Share this story. Post or tweet this story, maybe it will give your kids a hint! Leave a comment about Survey: Mother's Day Statistics? Share on Facebook "Survey: Mother's Day Statistics"